A 40-year old diabetic man presented with progressive lower limb proximal weakness since 6 months, and orthopnea and exertional dyspnea since 4 months. He had been having erectile dysfunction since 8 years. His family history was insignificant with neither of his family members having any neurological or any other medical condition. 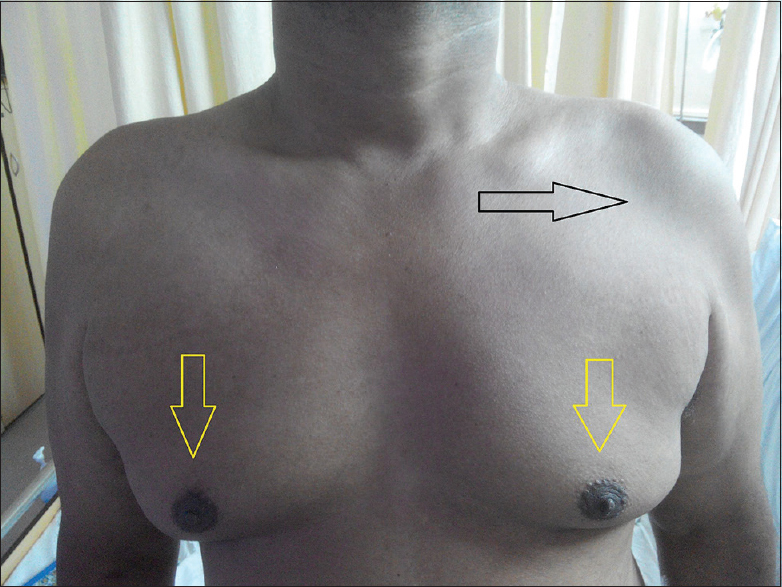 His examination revealed hypogonadism (small testes); gynecomastia [Figure 1]; paradoxical breathing and dysarthria; wasting of left deltoid [Figure 1], left supraspinatus, and left infraspinatus [Figure 2]; wasting of the tongue [Figure 3]; and fasciculations in both arms. Electrophysiological studies revealed widespread active chronic lower motor neuron type of denervation involving the cervical, bulbar, thoracic, and lumbosacral regions, with the site of the lesion being at the level of anterior horn cells, with no evidence of muscle disease/peripheral neuropathy. The sensory conduction was normal. The creatine phosphokinase (CPK) level was 322 U/L (normal range is 30–135 U/L). Serum testosterone level was 27 ng/mL (normal range for men is 3–9 ng/mL). Orthopnea and dyspnea were likely due to diaphragmatic muscle weakness secondary to anterior horn cell disease, and the elevated testosterone level was secondary to androgen resistance. With these clinical and laboratory features, a diagnosis of Kennedy disease was made. Genetic testing was not possible due to the financial condition of the patient. He was started on riluzole and physiotherapy. An improvement was seen in his muscle weakness. Kennedy disease, a rare X-linked recessive trinucleotide repeat disorder with a prevalence of 1/40,000, occurs due to expansion of a CAG repeat in the androgen receptor gene. The patients present between 30 and 50 years of age. The features include proximal weakness with wasting of bulbar and limb muscles, gynecomastia, elevated testosterone levels, and erectile dysfunction. 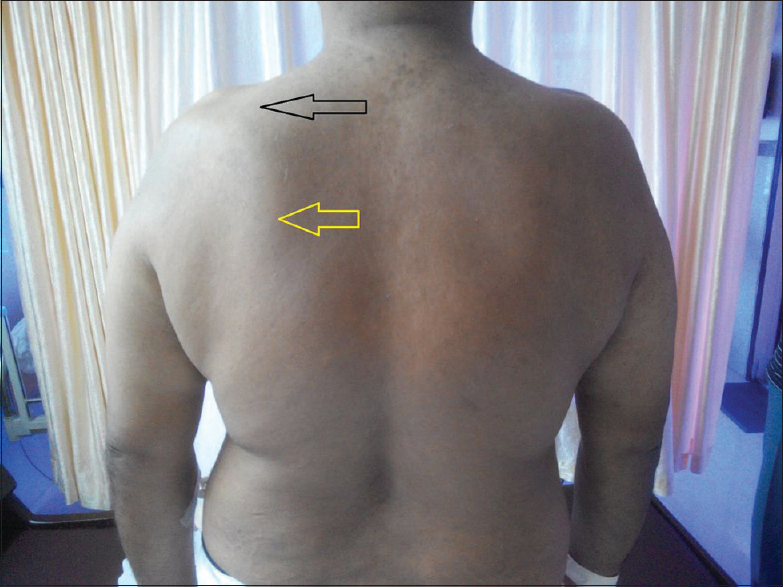 The patients manifest with an elevated CPK level, abnormal electrophysiological studies, and neuropathic and myopathic alterations are seen on muscle biopsy. Querin G, Sorarù G, Pradat PF. Kennedy disease (X-linked recessive bulbospinal neuronopathy): A comprehensive review from pathophysiology to therapy. Rev Neurol (Paris) 2017;173:326-37. Dubey A, Jain R, Sodani A, Chouksey D. A case of Kennedy's disease from India. Ann Indian Acad Neurol 2017;20:163-4.